Recruitment is a section for reviewing imported member information, by allowing a view of all profiles imported to the platform before they are registered as an invite or user. After importing a CSV of users and assigning their profile information, this information is created as profiles in Recruitment. Manage sending invites to email address. Convert imported tokens to invite codes. Merge update profile fields of users. Using the Send Invite function in Mass Action will send the selected profiles to Invites where you can edit the invite message, language, user role, and user group for the set of users before sending the invites. Here are instructions on sending invites. Using the Convert to Invite function in Mass Action will create the Recruitment profile as a pending invite without an email being sent. Converting to invite requires an email address or invite token to be converted. These invites can be used to manually send accept links or invite codes to users on the platform, so they can activate their accounts. 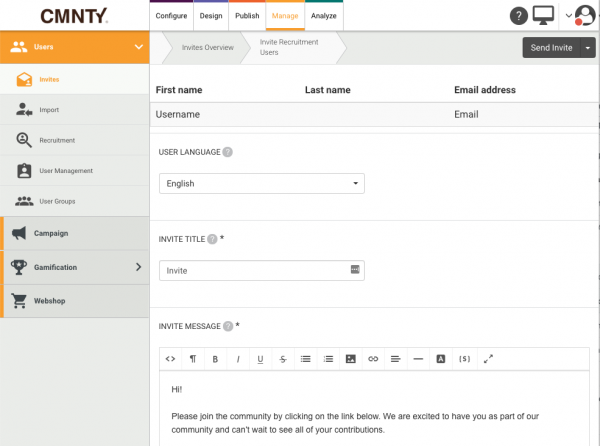 Convert to Invite will keep any profiles without an email address or invite token in Recruitment. Here are instructions on creating invite codes. Using the Merge function in Mass Action will update the profile fields of profiles that match the email address or invite token imported to the platform. This can be used to apply information to new or existing profile fields, which can be used for dynamic user groups or to keep profile information up to date. 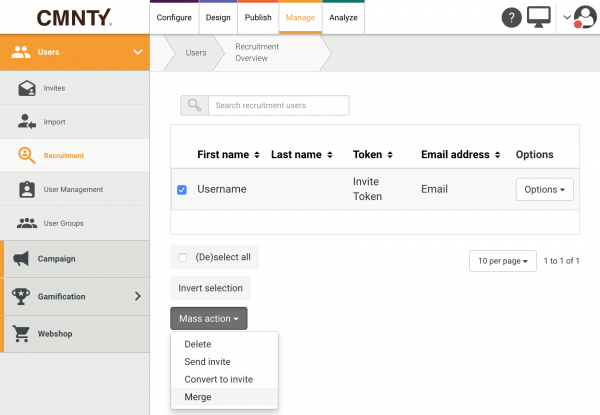 Merge will keep any profiles which do not match an email address or invite token in Recruitment. Here are instructions on merging profile data.